Here at DSP Robotics we have been working with many schools, colleges and universities, as well as teachers, pupils and parents all over the world with one aim: to encourage young people to get involved with technology, become digitally literate and, most importantly, be inspired! 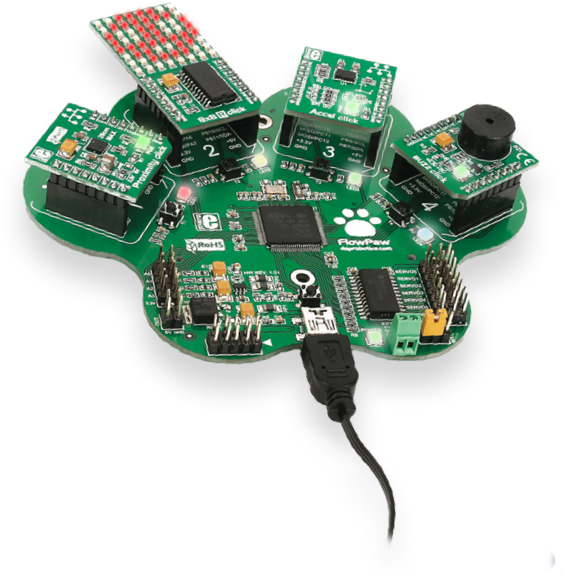 After alot of hard work we came up with FlowPaw - a multi-purpose, expandable, electronics board that plugs straight into your PC and works seamlessly with FlowStone to make programming a piece of cake. We launched a Kickstarter campaign to get FlowPaw to completion and thanks to an amazing set of backers this campaign exceeded its target and FlowPaw has become a reality! To learn more about FlowPaw visit our FlowPaw site at www.flowpaw.com.